The majority of the text displayed in a presentation is entered using one of the defined text placeholders. By default these text placeholders will display your text with a bullet point at the front. The purpose of the bullets points is to create a list of items (i.e. points you want to mention). Each bullet point is considered to be a separate paragraph. You can change the formatting of the bullets to make them more readable and to emphasis particular items. 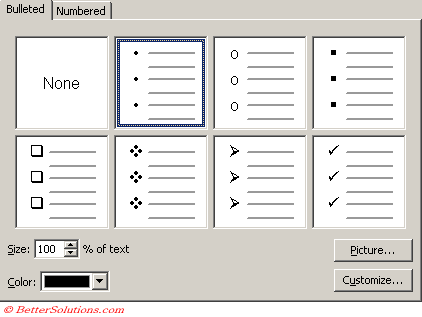 This can either be done manually to individual text boxes and lines or done using the Slide Master. Changing the slide master is a quick way to changing all the text boxes on all the slides in a presentation. It is also possible to remove the bullets altogether by using the bullets button on the Formatting toolbar. Bullets - This button is a toggle. Press it once to add bullets and then press it again to remove the bullets. You can change the formatting of your bullets by selecting (Format > Bullets and Numbering)(Bullets tab). Seven bullet characters are displayed by default but you are not restricted to just these. Press the Customise bullet to select a different bullet character. Size - This is a percentage of the size of the text. For more details refer to the ?? Page. Color - This lets you change the colour of the bullet point. See below. Picture - Displays the ?? Dialog box. Customise - Displays the Symbol dialog box allowing you to change the bullet character. For more details refer to the ?? Page. You can select a different colour by choosing "More Colours" to display the familiar "Colors" dialog box. What are Numbered Bullets ? PowerPoint lets you create bullets that are based on any font and can even use bitmap pictures rather than simple dots and arrows. To add bullets to a paragraph you do not have to highlight the whole paragraph. Just put the cursor anywhere in the paragraph and select the bullet button on the Formatting toolbar. If you want to change the distance between bullets and text for the entire presentation, make the changes on the ruler in the Slide Master. place the cursor in the text to display the ruler. Drag the top half of the lower indent marker of the ruler to a new position. at the bulleted paragraphs in the text object change to the new position. If you select an object, the ruler becomes a slide ruler with a zero point in the middle. It displays measurements for the entire slide. It is possible to animate your bullets so they appear one at a time. For more details please refer to the Animation section. (Tab) - Increases the indentation of the line to the next level. (Shift + Tab) - Decreases the Indentation of the line to the previous level. 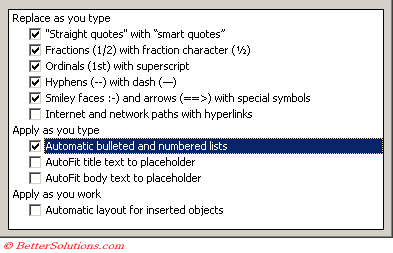 It is possible to create bulleted and numbered lists without using the two buttons on the Formatting toolbar. Select (Tools > AutoCorrect Options) and select the "AutoFormat As You Type" tab. When this option is selected you can create a bulleted list by typing an asterisk followed by a space before your line of text. When this option is selected you can create a numbered list by typing a number followed by a tab before your line of text. If you have chosen an unusual font for your bullet character you should embed TueType fonts when saving the presentation. PowerPoint 2003 will however not let you edit a presentation that contains any embedded fonts. You can always use the "Reset" button at the bottom on the (Format > Bullets and Numbering) dialog box to reset any of the default bullets if they have been customised. Bullets should be short and to the point. If you want to change the bullet character for every text box in a presentation then you should change the Slide Master. Try and avoid using too many indentation levels on the same slide. This will make your slides more confusing.